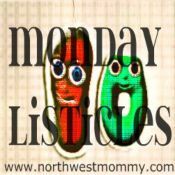 On this fine Monday I'm linking up with Monday Listicles and Mothering Moments to tackle their listy prompt, "ten things that happen in an hour of your life." But that doesn't quite fit the 10 Things requirement. Likewise, there are plenty of times it feels like I do about eleventy billion things in one hour, but posting a list that long is a good way to alienate my beloved, extremely attractive readers. Please don't go away - I would never make you read a list that long. I love you. Plus, as a bonus, I'm going to stop being creepy now. So I'm going to go middle-of-the-road (because you know the Blog Motto: Striving daily to achieve averageness!) and give you a taste of The Hour Before Bedtime here at casa de HTV. 7:56 - I issue the third reminder to PUT YOUR DISHES IN THE SINK AND RINSE THEM FOR THE LOVE OF ALL THAT IS HOLY WE GO OVER THIS EVERY DAY. 8:06 - One of the children is sitting by my side with their selected book. The other child sits down and announces that they don't want to read that book, and asks if they can get another book because [name of sibling] always gets to pick the book. (Of course.) Child disappears, and the baby decides she doesn't want to sit on my lap anymore. 8:16 - I finish chasing the baby around the living room, and join the two other kids and their books on the couch. Begin reading. 8:18 - I continue reading, but at greatly increased volume in an attempt to drown out the squirmy baby's loud whining long enough to finish Magical Family Storytime. 8:24 - Still reading at top volume (mmm, soothing) but now also increasing tempo until I reach the point that each paragraph is blurred into one syllable. 8:34 - I announce "The End" without regard to whether or not we've finished the book, and tell the kids to go brush their teeth. 8:37 - "One at a time! No playing in the bathroom! Don't forget to rinse your toothpaste spit down the sink. AND FLUSH! What do you mean you forgot to pee? Well, now your brother's in there, you'll have to wait. Well hold it, you didn't have to go that badly a second ago. Let's get your jammies. Yes, you have school tomorrow. No, you can't have dessert right before bed. Yes, I'll close your closet doors. No, there aren't any monsters in there. No, you probably shouldn't sleep with your collection of ChapStick. There, the bathroom's available now. Don't forget to flush. AND WASH YOUR HANDS. Honey, get your blanket off the floor. Put your DSi away; you have school tomorrow and you need your sleep. No, I don't mean after you finish one more level on Super Mario Brothers - turn it off now. Did you wash your hands?" 8:45 - Tuck the kids in, complete with hugs and smooches and as many repetitions of, "I love you don't let the bedbugs bite sweet dreams I love you good night" as they deem necessary. Retire to living room, wait 10 minutes and then go tell the Boy Child to turn off his DSi - again. And there you have it, 10 steps to a happy loving heartwarming bedtime. I only wish that bedtime could come more than once a day (that's HTV code for, "I'm totally lying"). One click on the banner below = 1 vote! Here's hoping the kids pick short books tonight. Do you think they'd notice if I just read some blogs instead? Quietly, to myself? While they weren't in the room? Ha! I love story time because that is soooo how it goes at my house. Complete with the whiney baby! Thanks for linking up! Thanks for hosting - it was a great prompt and I had fun reading everyone's list! I started twitching half way through because I was having flashbacks of every single night in our house. It's too early in the morning for those type of flashbacks. Haha! You're right, I didn't think about that angle - I try not to start stressing about bedtime until about 20 minutes after the kids should've already been asleep. Ha! I had my boys four years apart. The first always got a bed time story (usually Little Critter). The second? Well let's just say he got short changed on almost all of the mommy stuff. I think for a while I was having the oldest read to the youngest (2 birds-1 stone) so he could practice his reading. That's such a good idea - it really worked for us for a while! But it didn't take long before there was more bickering than reading. "You read too slow. Let me see the pictures! What? You're going too fast. I want Mommy to read. Mommmmmmy, he didn't let me see the pictures. Stop interrupting!" You just wrote my every night. Good, one less think I have to write myself. It isn't easy enriching our kids' every waking moment with Enriching Forms on Enlightening Enrichment, is it? Talk some more about how your readers are extrmely attractive, that was my favorite part of the story. Maybe that's the one you should use for story time too. I'm sure they'll be so impressed that they will start rinsing the toothpaste spit without any reminder. Unfortunately, I can't tell my kids how awesome and good-looking my readers are because it reminds them I have a blog and they start asking too many questions. As it is, I have to lie to them about the name of the blog so they can't find it on the innerwebs. You are super funny Robyn, so glad you joined us! I think a martini is in order as number 11. Bottoms up. Too right, about the end result and the martini! Thanks so much for visiting - I always love your Listicles, so I was happy to finally link up! If only our kids would ever do what we tell them to. Then hours like this would be easier - without the repeated reminders of what they're supposed to do. My girls no longer ask for bedtime stories. They just read on their own. But you're reminding me that maybe we should start reading to the darn baby. He wouldn't listen anyway. Bedtime is the best time for me every other night, those nights where my hubby puts them down! Yup! It was soooo much easier when they couldn't read and I could just wrap up the story all of a sudden, or start turning pages 4 at a time... Why DID I let them learn how to read?!?!? Our nights are not complete unless the youngest then proceeds to get out of bed literally every 3-5 minutes for the next hour or so. Good thing they're cute, right? That's right, otherwise they'd be goners. We had to make a rule: each time you get out of bed after you were tucked in, your bedtime gets moved up 15 minutes earlier the next night. It worked like a charm, for about two nights. Sigh. I thought I heard screams, but then I just figured it was the kids and went back to what I was doing. Hilarious...thanks for making me laugh about my past, present and future bedtimes...we have bathroom fighters here too! What is it about the bathroom that makes kids completely forget what they were supposed to be doing? I mean, it's a tiny room, and there aren't a whole lot of options for different activities (or so you would think). Parenthood is 50% trying to get them out of the bathroom when you're using it, and 50% trying to get them to use it when you aren't in there. Lodging it into something uncomfortable?! Ha!!! I hope you get regular pedicures for that. You know what I'm talkin' 'bout... :) I should make their bedtime later, like 4 AM, so when I get them in bed by 10:30 it feels like a real accomplishment. What a neat prompt!! Great share of your hour. Thank you, Jamie! Glad you were here! It's crazy the things she tries to sleep with - Chapstick is the least of it. The other night I caught her sneaking a box of crayons and markers the size of her torso under the covers (the BOX was that big, not the markers - that would be cool, though). Really? Are we sleep-coloring now? And did you think I wouldn't notice you giant collection of art supplies when I tucked you in? I totally get the nightly story time ritual--reading fast, loudly, and trying to control everyone! Ha! Great list!